Applications: Suitable for paint and lacquer preparation on mild steel and aluminium and fine finishing of samples and precision components. Product Notes: 'C' weight (medium) backing giving a good balance of stiffness for surface finishing and flexibility for curved panels etc. Wet or dry use. 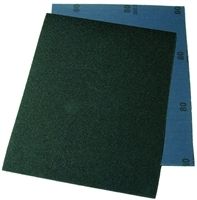 Silicon carbide abrasive is fast cutting on both bare metal and coatings. Stocked from grade 80 to ultra-fine 1500 grit, with 2000 grit available on request.